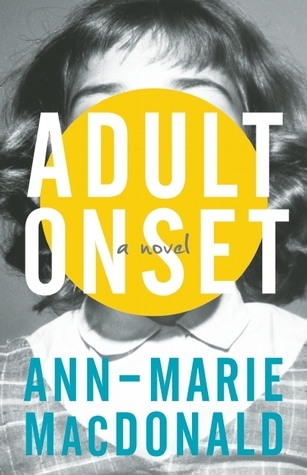 I have read and liked Fall On Your Knees, The Way the Crow Flies, and now Adult Onset. I would recommend any of them. But, Adult Onset is the one I can relate to most. Among the rewards of parenting, it is full of the chaos and angst of having children and trying your best to be a good parent. Mary Rose MacKinnon (MR/Mister) is a 48-year-old stay-at-home mother of two young children. She is also a wife, daughter, and sister – all of which are relevant in every way to the story and how she sees herself as a person and a parent. The book covers one week in the life of Mary Rose, as she parents her kids single-handedly while her partner/wife is away for work. A phantom pain in Mary Rose’s arm brings back memories of her childhood; her mother’s miscarriages and stillbirths and the resulting depression, her father’s role in her life, and her painful experience with bone cysts. Throughout this book, her days with the children are the center of everything and the part I enjoyed the most. She captures their joys and sorrows, their frustrations and demands; the freedom of swinging in the park; the determination of a 2-year-old who wants her ladybug boots instead of her winter boots; the humiliation of a 5-year-old who didn’t quite make it to the toilet; hamsters getting loose; macaroni up the nose; spills to clean up; her own cracked and bleeding hands from so much washing. The depiction of the monotony and chaos of full days spent with children are bang on. Her guilt and struggle over her feelings as a parent and trying to get it right are something all mothers can relate to. Her attempts to control her anger, fear of her outbursts, and doubt of her abilities are heart-breakingly real. Mary Rose has a lot to feel angry about; her mother’s depression when she was a child, and how her parents treat her when she comes out to them at the age of 23 (“I would rather you had cancer“). How do you tell yourself what you already know? If you have successfully avoided something, how do you know you have avoided it? Land mines of anger left over from a forgotten war, you step on one by chance. Sudden sinkholes of depression, you crawl back out. A weave of weeds obscures a mind-shaft but cannot break a fall, you get hurt this time. A booby-trapped terrain, it says, “Something happened here.” Trenches overgrown but still invisibly from space, green welts, scars that tell a story. You press on. As she tries to work out her pain of the past in an effort to move forward in a positive direction, she realizes that her life is her own and she can make of it what she wants. It is possible to know all this, and yet have no place to put it. It is possible to be outside on a sunny day, but trapped inside a cave. Ann-Marie MacDonald packs a lot of messages into this book that is partly autobiographical. I love what she has to say about parenting, family, marriage, depression, and aging. I think it is the kind of book that readers can take from it what they want and need. We never thought we’d be able to get married. We thought we were out in the cold, so we made the cold into a party, but cold is cold and family is family and you guys are mine. Reading through the Goodreads reviews, I was surprised by some of the low ratings. Those who gave it a low rating seem to be unimpressed with the day-to-day aspect of the protagonist’s life, and the fact that we are very much inside her head. These are the things I liked most about the book. This is what life is for most of us; the day-to-day routine; reconciling the past with the present; the relationships we have with our partners and family members. This is real life. Read about how Ann-Marie MacDonald “mines her own life” in Adult Onset at The Montreal Gazette. For a beautiful thorough review of Adult Onset, visit Pickle Me This. The Globe and Mail article: Love, anger, and pride: How Ann-Marie MacDonald learned to let go of the past. You can abuse a child without breaking a single law. All you have to do is fail to see them. Exile is hard; coming back from exile can be harder. Pride is symbolized by a rainbow, not just because it leads to Oz or a pot of gold or even because it signifies diversity, but because it spans the sky and holds us all. What matters most is not what’s over the rainbow but who is under it. Sounds good — thanks for the recommendation, Naomi. I just finished reading A Measure of Light yesterday. The responses to the birth and burial of Mary Dyer’s child are haunting. And then there’s that scene when she returns home after so many years away and doesn’t know which of her children is which. Fascinating book — so glad I moved it up higher on my list after I read your review. I’m so glad you liked it! I learned so much from it, but in a way that I didn’t really notice I was learning. ‘Haunting’ is a good word for most of her life – I was so glad that I was me and not her, here and not there. I like the sound of this one. Isn’t it funny though that when a female writer mines her daily life it is considered dull, but when a male writer like Karl Ove Knausgaard does it, it’s considered revolutionary. Hope you are well Naomi! Good point, Cathy. I hadn’t thought of that. I was just surprised that anyone would think her story was dull. I loved every bit of it. It’s good to ‘see’ you back, Cathy! I hope you had a nice rest. I really liked Adult Onset as well, though I found it quite different from her other two books. The thing is, Mac Donald can write. I will read anything she comes out with. I preferred her earlier two books as they took me away from my own life a little more than this one did. Isn’t it funny that I preferred this one for the opposite reason? But, you’re right, she can make anything sound good. I loved her musings at the beginning about how urgent life seems now with e-mail and facebook, etc. I tend to agree with her. It’s been so long since I read her first two books, I wonder what I would think of them if I read them again now? True, I haven’t read either of them since they came out! I loved Fall on You Knees. I was scared to approach this one after I heard it was VERY much based on her experiences in her life. Did you know that fact? Did it take you out of the story? Great review, Naomi. I did wonder, as I was reading, what was fact and what was fiction, which can be a bit distracting. But, on the other hand, I also found it made the story even more fascinating, knowing that it was based on her life. I suspect it is a kind of a safe way for her to write about her life – readers will never really know how much of it is true. A safer (more private) way to write a memoir. I liked Fall On Your Knees but I haven’t run across any more MacDonald books. I’ll have to look for her. If you liked Fall On Your Knees, then you will most likely like her other books as well. I did! I read it a long time ago, but it seems like I got one other book by her afterwards that I didn’t like as much. I’m not sure, though . . .
You might have. I did like her first one better than her second. Well, now that I look at her books, I’m not sure I read another one. Maybe I haven’t seen any by her at the used bookstores where I usually shop. I used to look for quite some time after I read Fall On Your Knees. I’ll have to start looking again. I don’t think I’ve come across any of MaDonald’s books yet. I’ll have to look for this one because I really like the one quote: “A mother is never just this one thing, even at the worst times when she imagines she is.” Very true! I love that, too! I think any mother would like this book, and find things to relate to. I hadn’t realised Ann-Marie Macdonald had written another book. I loved both her earlier books though it’s years since I read them. Yes, it’s her first book in 10 years. It’s very different from her other two books – more personal. But, I think I liked it better because of that. And, of course, her writing is still wonderful. This is such a great review, Naomi. Even though I don’t have kids, I think I’d quite like this. I loved Fall on Your Knees and recently acquired The Way The Crow Flies, and hope to read that soon. Thanks, Kim! You definitely don’t need to have kids to like this book – there is so much more to it. Even just the way she writes makes it worth reading. There were so many great passages I wish I could have included (it would have gotten pretty long). And, there is a lot of humour, which I’m not sure comes out very well in my review. I’d like to hear what you think of it! There were elements of this novel that I really loved, but they weren’t present as often as I craved them; I wanted more artistry, more layers to some of the aspects of the story, which is quite likely another book entirely and I realize that’s not fair because it’s not my book to write. Ultimately I think it possesses the same kind of intensity that her two previous novels exhibited (I loved the atmosphere and sense of must-turn-pages with Knees and the incredible detail and immersion in Maddy’s POV in Crow) but I felt as though I was on the margins of Adult Onset, whereas I wanted to be embroiled. Perhaps it was a wrong-book-wrong-time instance, for I can certainly see many good qualities therein, so maybe I’ll try a reread at some point. I wish I could remember her other two books better – I read them so long ago. 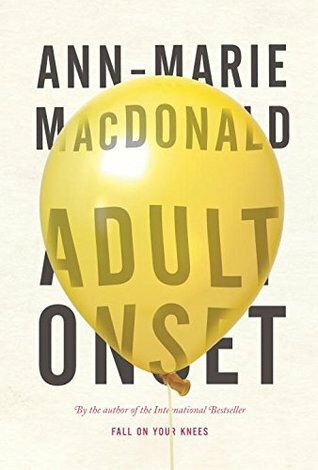 I liked the humour in Adult Onset and reading about some of the things that were going through her mind. But, I really think she nailed the parenting thing, which is hard to do. At least, I haven’t read a lot of books where I have thought that. Roost was a good book that way, too, but a little too light for me. When I read it, (1998?) I thought Fall on Your Knees was the best thing I had read in years and I wondered how much of it was autobiographical. The Way the Crow Flies was very different but I was blown away by the accuracy of the detail of what life was like in the 50’s and by her writing. Thanks for this review and the links, Adult Onset is one I definitely want to read. BTW, she also has a play, Belle Moral. The themes and stories of all four are quite different but the writing in each is superb. I think I read that The Way the Crow Flies is based on events that took place in a place she lived as a girl (a military base – I can’t remember which one now), but I’m not sure about the inspiration behind Fall on Your Knees. I learn something everyday. Today’s lesson: “Sometimes things need to get worse before they can get better.” Those words sum up what plot is. And the worser the better. Because bad things happen to good characters. And really bad things happen to really good characters. Now I need to go and dump a pile of bricks on a car. I have this character who is getting really out of hand. That will teach him. When I read that quote, the first thing I thought of was how messes get worse in the attempt to tidy them up. Which is weird, because I try to avoid tidying up. I hope your character has learned his lesson. Only after things get worse. I was uncertain whether I wanted to read about what I already experience daily as a parent, but you make the author’s perspective sound emotionally raw. I also liked what Cathy said about female vs. male writers writing about every day life. How true! I don’t often want to read about parenting, either, but this book is so much more than that. Her writing and thoughts pulled me right into the story. I loved her other novels but I could not get into this one. I even tried it twice. Maybe I’ll come back to it down the road. I know many people love it. So interesting how books grab some people and not others. I don’t think you are entirely alone on this one, though, based on some of the Goodreads reviews.